Spring is a time of great change. The dormancy of winter gives way to energetic new growth. In this period, the dark skeletons of deciduous trees begin to show colour and movement, and when you look closely there is some fascinating detail to complement the obvious beauty. One of the aspects of spring I most love is blossom. While I suspect most people reading this article enjoy being out in nature just for the sake of it, we also have a practical interest in nature from a bushcraft and survival perspective. This is why it is useful to be able to identify trees and plants. They are the raw materials for much of your bushcraft. The species highlighted below are all widespread in their geographic distribution and common where they occur. Being able to identify them has some worth, for food, utility or because they contain poisonous substances we should be aware of. The following six species are all members of the rose family, Rosaceae. They all display attractive blossoms and share some common characteristics, not least in their flower structures and, later in the year, their fruits. A couple have sharp thorns, something that is reflected in their English common names, blackthorn and hawthorn. As with a number of the rose family, some of the species here also contain cyanogenic glycosides. These are substances associated with a bitter almond taste, breaking down to release hydrogen cyanide when digested. Two of the species here, bird cherry and cherry laurel, contain significant and potentially harmful concentrations of these glycosides. Blackthorn is generally a scraggy-looking untidy bush, sitting shoulder-to-shoulder with other hedgerow species. It is viciously spiny and forms dense, dark, impenetrable thickets. 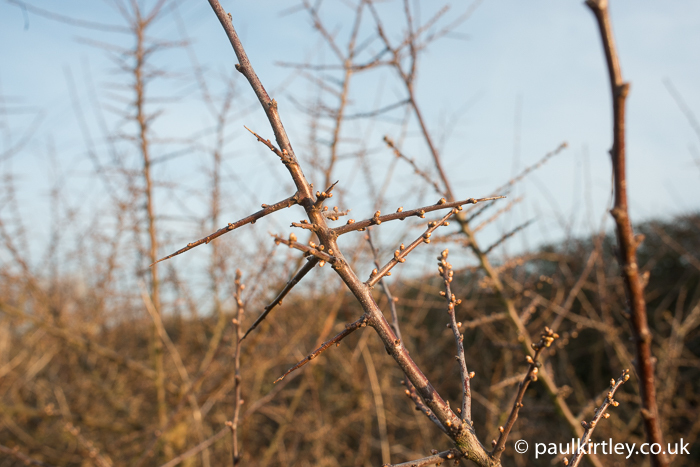 Many of the side shoots of blackthorn end in vicious spines. Small buds are present on these and the main shoots. The flowers emerge distinctly before the foliage. You can see the flower buds already swelling here in the last week of March, in County Durham. Blackthorn is typically in bloom in April. Photo: Paul Kirtley. 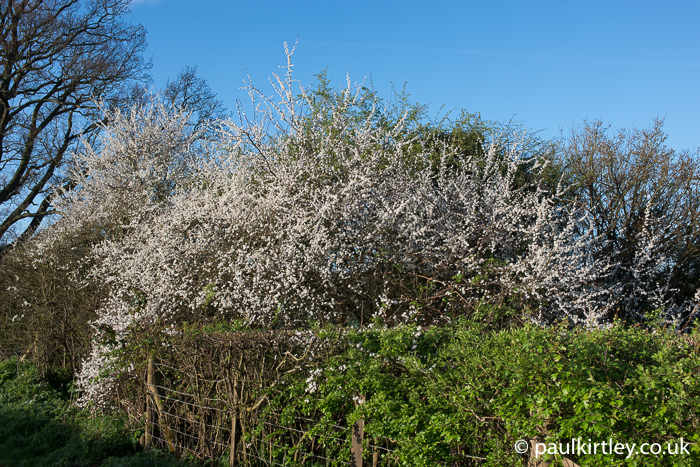 When blackthorn comes into flower, it really stands out from the crowd. Partly this is because blackthorn bloom comes in late winter or early spring. There’s also little warning, with the flowers coming out before the leaves, causing blackthorn to transform from winter darkness to spring brightness almost overnight. The small, oval leaves come out later, after flowering. Blackthorn in bloom. You get a general sense of the character of the species from this photo. Thicket formed here looks dense and impenetrable. Photo: Paul Kirtley. 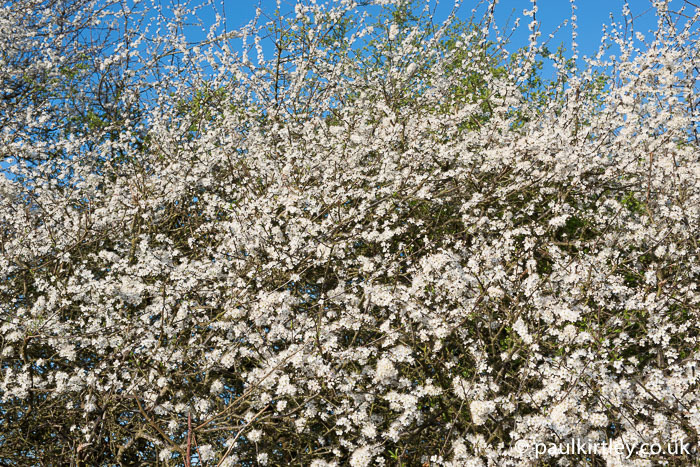 A dense covering of blossom on blackthorn is typical. Again there are no leaves yet present. East Sussex, early April. Photo: Paul Kirtley. 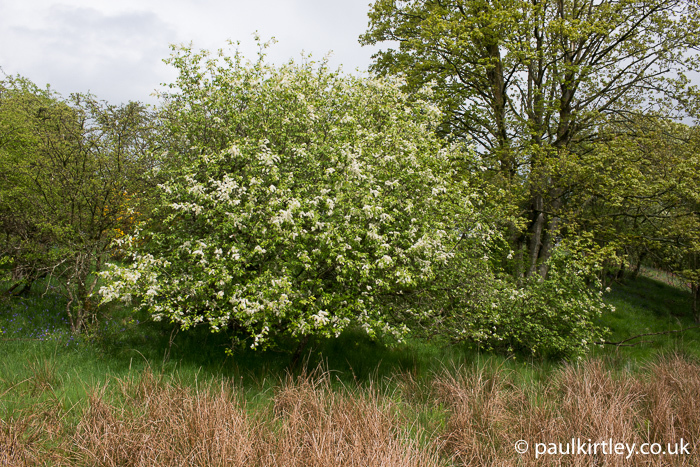 Each off-white flower is held singly on the bush by a very short stalk but there are many of them, close to each other, giving blackthorn blooms a very busy appearance. Stand back and the bush looks densely covered in flowers. Each flower has five distinct, delicate petals. Blackthorn flower detail. The flowers are on short stems and slightly off-white. Note there are no leaves on the shrub yet. There is a very busy character to this species when in bloom. Photo: Paul Kirtley. Have a nibble of a few petals. They will taste faintly of almonds. Make a mental note of where the flowering blackthorn bushes are in the spring. 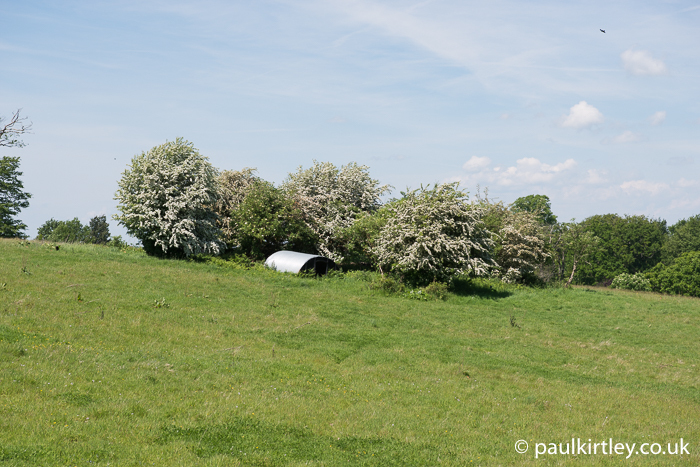 This is where you’ll return to forage for sloes later in the year. In most places you find this species, it has infiltrated without attracting much attention. It is thought to be originally from the Balkans but is now naturalised over a considerably wider geographic area, including much of the UK. Other names for Prunus cerasifera include myrobalan plum. Cherry plum is often mistaken for blackthorn, Prunus spinosa, particularly when it comes into bloom in late winter or early spring. Blackthorn is often said to be the first blossoming species in the hedgerows. While it may be true blackthorn is the first blossoming native species, cherry plum, if present, is usually ahead of it, by up to a month. We noted above that blackthorn comes into bloom with no leaves present. 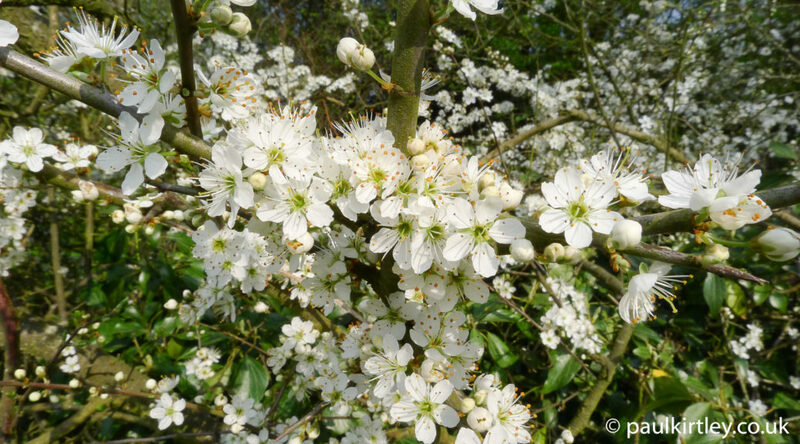 While a hedgerow specimen of cherry plum may look very similar to blackthorn from a distance, Prunus cerasifera, however, produces its green leaves very shortly behind the flowers, while Prunus spinosa shoots are devoid of leaves at the time of full bloom. On closer inspection, there are other differences too. Cherry plum does not have the vicious spines of blackthorn. The flowers of Prunus cerasifera are held on longer stalks and are more solitary than the dense clusters of short-stemmed flowers on Prunus spinosa. 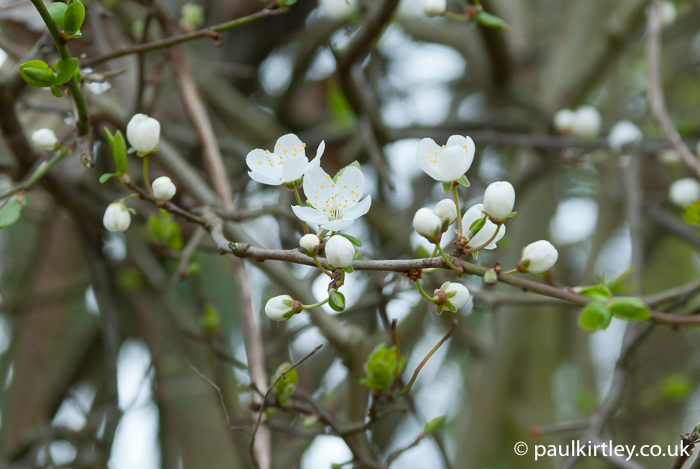 The flowers of cherry plum are a more pure white than the creamy off-white of blackthorn flowers. 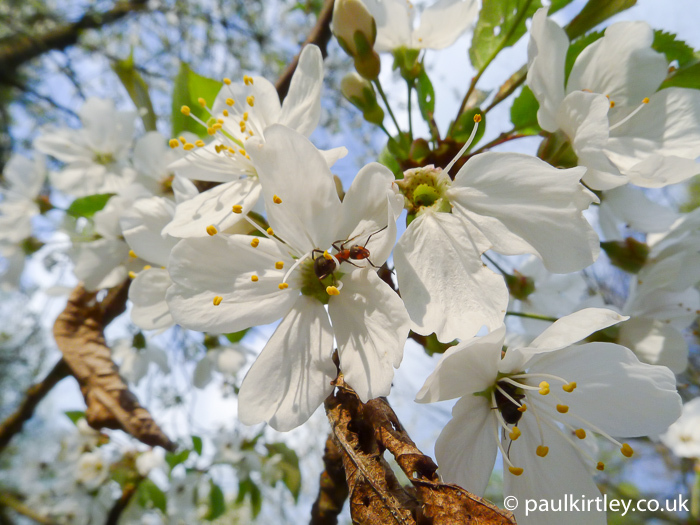 The blossom of Prunus cerasifera is very white. The flowers tend to be solitary and are held on longer stalks than blackthorn. Young green leaves are emerging at the same time. Kent, early March. Photo: Paul Kirtley. There is another vairant of cherry plum, known as Pissard’s plum, Prunus cerasifera ‘Pissardii’, which is said to have been selected in Iran in the late 19th Century. 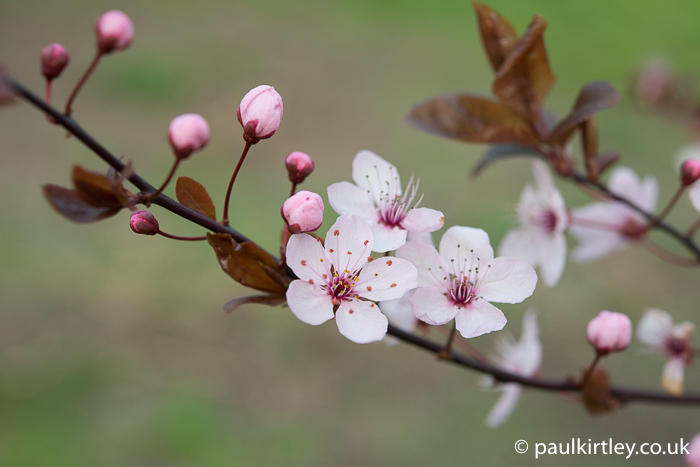 This is very similar to the above cherry plum but has pink flowers and burgundy foliage. Again the foliage will be unfurling hot on the tails of the flowers, in late winter or early spring. This is much more of a park tree. The purple-leaved version of the cherry plum, Prunus cerasifera ‘Pissardii’. This is more of a park tree. Young leaves are expanding at the same time, which is typical of this species in general. London, early March. Photo: Paul Kirtley. The fruit of Prunus cerasifera is either red or yellow, about twice the diameter of a large cherry and somewhat plum-like in appearance. It is indeed considered a type of domesticated plum in some botanical circles, with the alternative scientific name Prunus domestica var. myrobalan. Whichever way you classify this species, the fruits are edible and worth looking out for in the summer. Hawthorn is the only one of the six rose family species in this section that is not in the Prunus genus, the plums. Hawthorn is still relatively closely related, though; you need only look at the flowers to see this. Again they have a nearly white colour, with five petals. Later in the year it develops a fleshy fruit with a stone in the middle. Sadly not as enjoyable straight off the tree as some other species here but nevertheless edible and a good material for making a fruit leather. You can easily tell a hawthorn apart from a blackthorn in the spring as the leaves of hawthorn emerge first, with the blossom coming later, whereas it’s the opposite order for blackthorn. 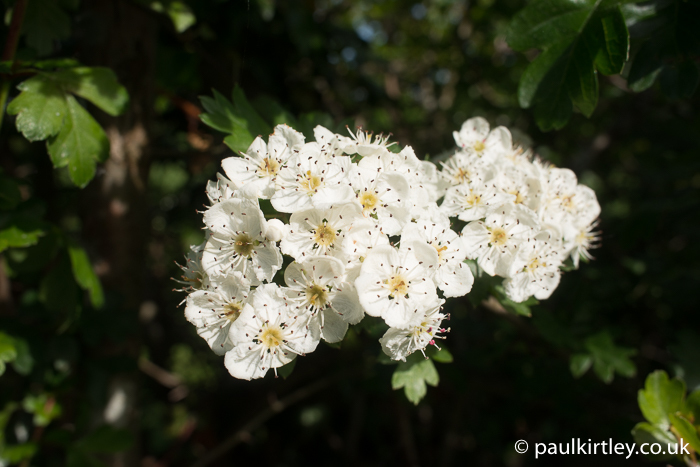 In some localities, another colloquial name for hawthorn is “May”, reflecting when this species typically flowers. The leaves of hawthorn are deeply lobed and very distinct from the simple ovals of blackthorn and other Prunus species. Hawthorn is easily spotted from a distance. East Sussex, May. Photo: Paul Kirtley. Hawthorn leaves come out before the blossom. Photo: Paul Kirtley. 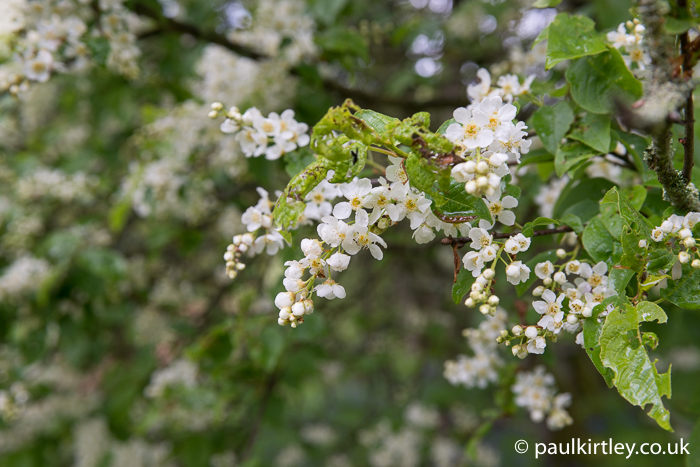 Hawthorn blossom detail. The rose-family character is clearly visible. Photo: Paul Kirtley. 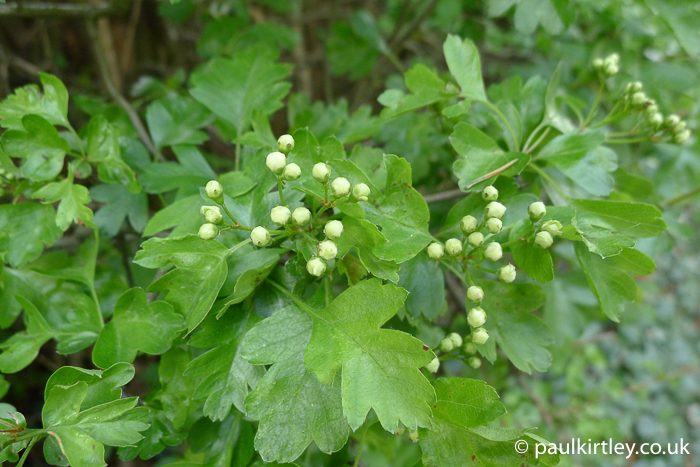 Both the spring leaves and the flowers of hawthorn are edible. Late in the summer and into autumn we can harvest the fruits, which make good fruit leathers. The thorns can be used to make a variety of fish hooks and the wood is excellent firewood. If you live and operate solely in the south of the UK, you may never have seen this species. I grew up with it in the north east of England and there is much of it in the woods there. It has a distinctly northern distribution, not just in the UK but also in Europe. Where it occurs, bird cherry is common and it’s worth knowing. When you break the twigs, the green wood has an acrid, unpleasant smell, indicating some of the toxic substances with this species. The fruits eventually also contain potentially harmful quantities of poisonous substances. It is possible to process the fruits to a point where they are safe to eat, using heat to drive off the cyanide, but you shouldn’t eat these cherries straight off the bush. 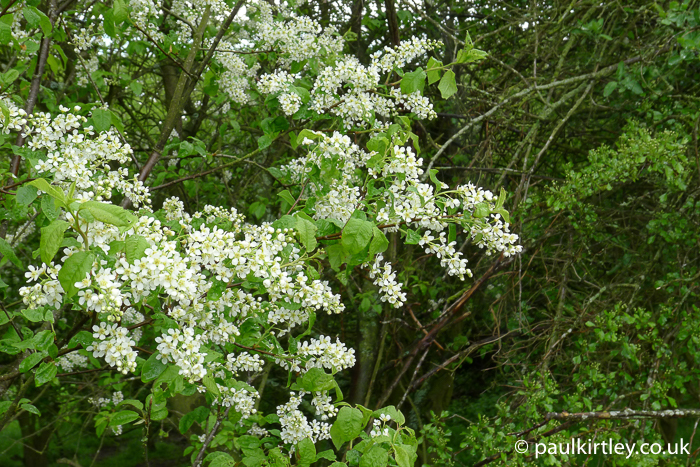 Bird cherry coming into bloom in early May in the north east of England. Photo: Paul Kirtley. Bird cherry flowers arranged together in spikes (racemes) at the shoot tips. Photo: Paul Kirtley. The leaves are similar to those of the edible wild cherry but the arrangement of the flowers is different. Remember fruits form from a flower, so your understanding of identifying the fruits starts with recognising the flowers and how they are arranged. Bird cherry has flowers clustered towards the ends of its shoots, forming spikes or tails, known as racemes, which tend to droop under their own weight. There are leaves at the base of these flower spikes. Bird cherry is deciduous. Bird cherry flowers are arranged along a shoot, together forming a structure known as a raceme. County Durham, May. Photo: Paul Kirtley. The individual flowers themselves are similar to the other closely-related species in the genus Prunus, featured here. Again, almost white, with five petals. But the arrangement is distinctive and leads to an analagous arrangement of the cherries later in the year. Compare and contrast with wild cherry, Prunus avium, below. Also known as gean, this is one of the best wild fruits to eat fresh and one that is ready earlier than many. The problem seems to be that many birds, particularly pigeons, also like them. But if you like pigeon, and have a means of “gathering” the birds, then this is also useful information. 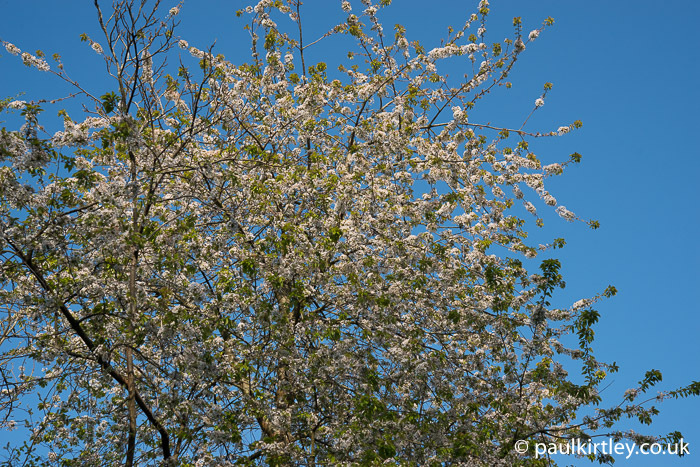 A wild cherry standing tall in the Sussex woods, coming into blossom in early April. Photo: Paul Kirtley. Prunus avium can grow to be a tree of considerable size, much larger than our other native cherries or plums. This in itself can help identify a wild cherry. The shiny bark also has prominent horizontal lenticels. In terms of spring-specific features, the clustered terminal buds, which resemble those of oaks, sprout forth leaves and flowers around the same time. The trees can soon be laden with thick white blossom, almost as if there has been a heavy fall of snow. Wild cherry blossom comes out in profuse clusters along with the new leaves. East Sussex, April. Photo: Paul Kirtley. Wild cherry flower detail. Note the long stalks and floppy petals. Photo: Paul Kirtley. The leaves of wild cherry are oval, pointed, with serrated edges, overall having a nice symmetry and tidiness to them. 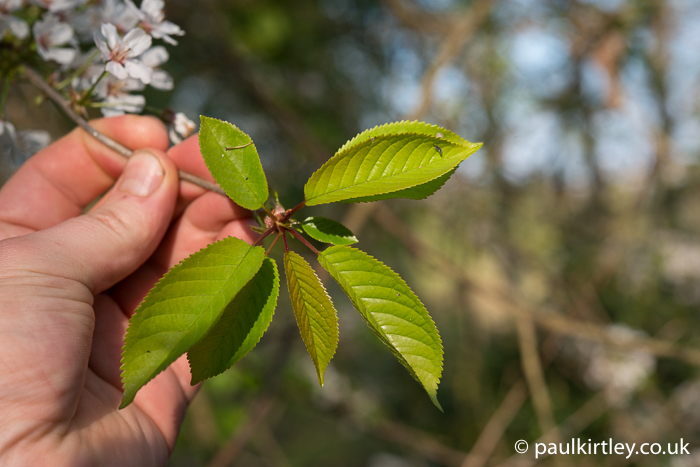 The flowers are somewhat bigger than the other Prunus species in this article and the petals are all the more floppy-looking as as result of their greater area but no greater thickness. Fresh new leaves of the wild cherry. Note the blossom present at the same time in the background. East Sussex, April. Photo: Paul Kirtley. The flowers of Prunus avium are held on long stalks, which are, of course, ultimately the long cherry stalks most of us are familiar with. As well as the A-grade fruit this species creates, the wood is lovely to carve and seasons to an attractive rich red-orange. I include cherry laurel largely because it is related to the above species and contains a significant amount of cyanogenic glycosides, substances which release hydrogen cyanide when they are broken down by your digestive system. The flowers of cherry laurel are arranged similarly to bird cherry, in spikes, and the fruits are indeed a type of cherry, even though you should not eat them. Cherry laurel originated around the Black Sea but has been introduced much more widely, which is why you may need to differentiate it from the other species here. I see it regularly in many places in the UK and have seen it frequently in western Europe too. 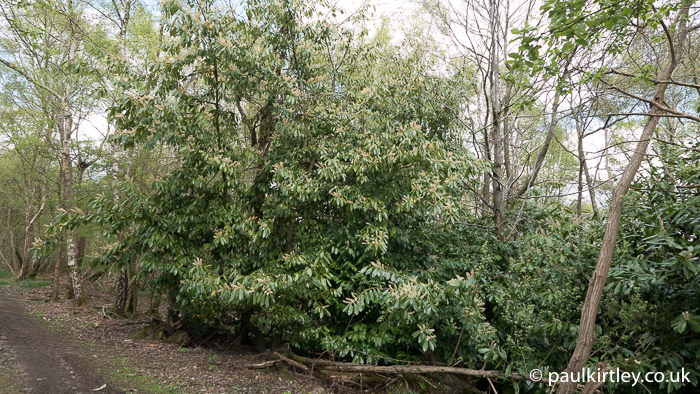 Cherry laurel growing amongst native species in the south of England. Photo: Paul Kirtley. The leaves, while similar in their oval shape and size to wild cherry, are thick and shiny, however, more like a Rhododendron leaf. Indeed, many people mistake this species for a Rhododendron, based on looking at the leaves alone. The leaves of cherry laurel are evergreen and also similar in character to the leaves of the bay laurel, Laurus nobilis, to which cherry laurel is not at all related, despite the similar common names. 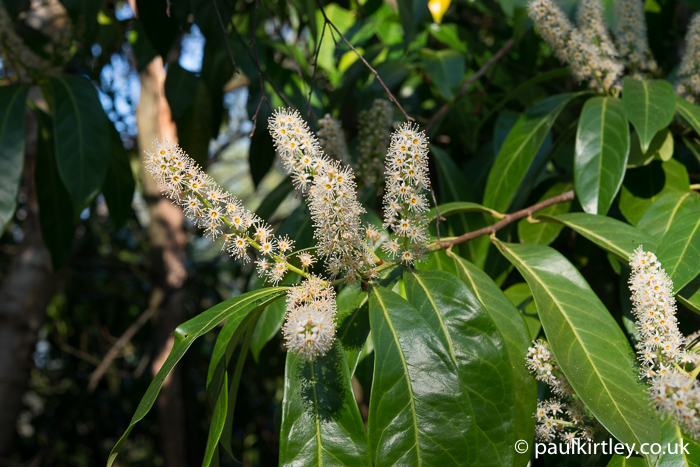 Cherry laurel’s upright flower spikes and glossy leaves. Photo: Paul Kirtley. If you crush one of the leaves of Prunus laurocerasus, after an initial “cut grass” type of smell, it smells increasingly strongly of almonds. Think Cherry Bakewell or marzipan and you can imagine the smell. The flowers are arranged in upward standing spikes, or racemes, that follow through to be drooping clusters of berries. In this respect they most closely resemble bird cherry, Prunus padus of the other species here. There are no leaves at the base of the flower spikes of cherry laurel, however, and bird cherry is deciduous, not evergreen like cherry laurel, with each species having quite distinct leaves. Exuberant sprays of white or creamy blossoms are not limited to the cherries and plums. Here we have two species with some similarities to each other. 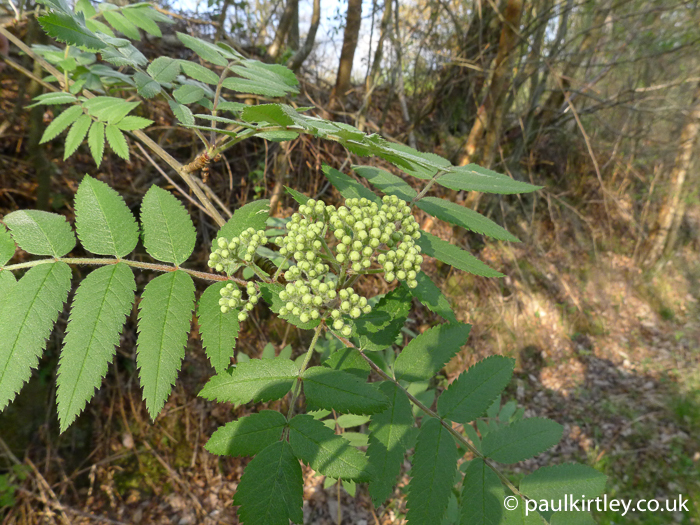 The first, rowan or, mountain ash, Sorbus aucuparia, is yet another member of the rose family, this time in a genus that contains whitebeams and service trees. The second, European elder, Sambucus nigra, also displays superficially similar clusters of white blossom as well as having a similar leaf-structure to rowan. People can confuse the two but they not closely related. Rowan is in the rose family and the individual flowers bear familiar resemblance in having five distinct petals and radial symmetry (like a child’s hand-held windmill). The creamy-white flowers are grouped together into dense clusters, each cluster very distinct on the tree. These ultimately give rise to the clusters of pillar-box red berries we see later in the summer. 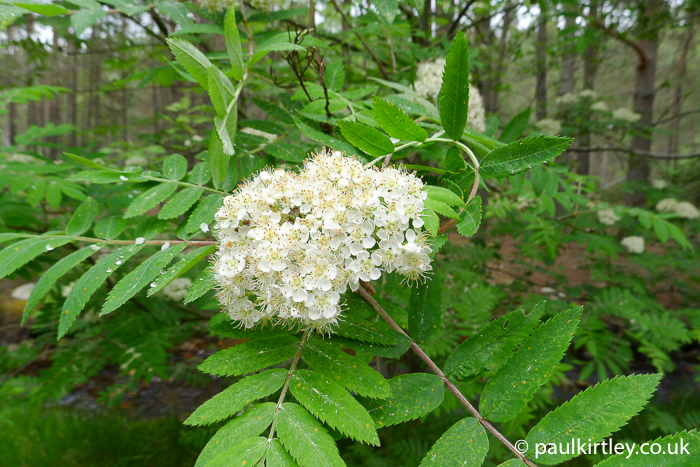 The leaves of rowan are technically what is known as pinnate compound. A compound leaf is a leaf that is made up of a number of leaflets. Pinnate just means like a feather – with a central rib and leaflets off to each side, giving a feather-like appearance. You can see this structure easily in the photos here. Each leaflet is ovoid but with relatively parallel sides and neatly serrated. Each leaf has multiple opposite pairs of leaflets as well as a terminal leaflet, that is a leaflet on the end of the mid-rib. They typically have 6 or 7 opposite pairs of leaflets and a terminal leaflet. While the cherries and plums are starting to blossom, rowan will still be dormant. Early in the spring you may have to identify rowan by its silvery and quite smooth bark and its grey, furry little buds, the description of which I like the most is being reminiscent of the abdomen of a small, hairy spider. The buds of rowan are like a hairy spider abdomen. Photo: Paul Kirtley. When the tree does visibly come to life, it is with the leaves first, then a little later the blossom clusters begin to form. Rowan makes good carving wood but poor firewood. It is a sacred tree in Scandinavia. The fruits are extremely astringent and unpalatable raw. They are much better at least heated into a “fruit mush” but best made into a jelly. 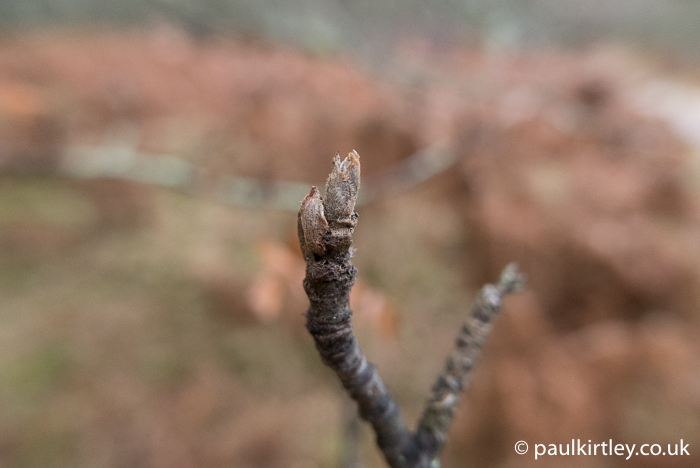 Not long after the rowan leaves are fully formed, the blossom is forming. East Sussex. Mid April. Photo: Paul Kirtley. Rowan blossom in full splendour. Cairngorms, Scotland. Early June. Photo: Paul Kirtley. European elder, or just elder, is generally a shrubby bush or a scruffy-looking small tree. At all stages the bark is quite distinctive and recognisable. The bark starts green on young shoots then turns a shiny grey, with prominent warty lenticels. As the bark matures, it becomes deeply furrowed and cracked. 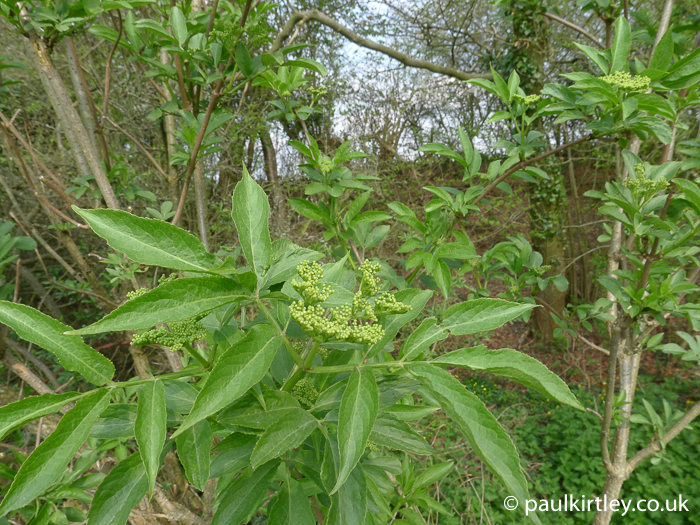 Elder has shoots arranged in opposite pairs and when the buds (which look like funny little purple vegetables) sprout, often quite early in the year, they send forth pinnate compound leaves. The leaves of elder, while similar in structure to the leaves of rowan, are easily distinguised. The leaves of elder have fewer leaflets (usually only 2 or 3 pairs plus a terminal leaflet) and the leaflets themselves are more pointed, less evenly toothed, more oval, less parallel-sided and ultimately larger than those of rowan. Elder can start shooting early in the year. East Sussex, late January. Photo: Paul Kirtley. When crushed elder leaves have a distinctive sharp and acrid smell that most people find somewhat unpleasant. 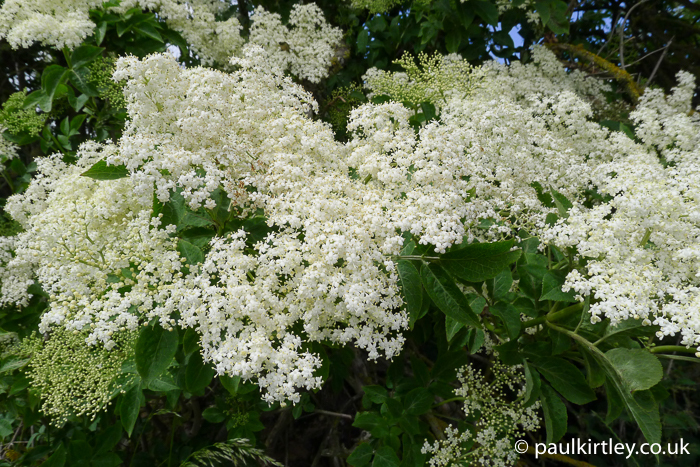 Elderflowers, by contrast, have a lovely sweet perfume and, of course, can be made into a fizzy floral cordial or wine. These dense clusters of flowers, if left on the bush or tree, will eventually form into what were once known as the Englishman’s grape. The dark-purple, near black, elderberries of Sambucus nigra are easy pickings and very tasty when ripe. 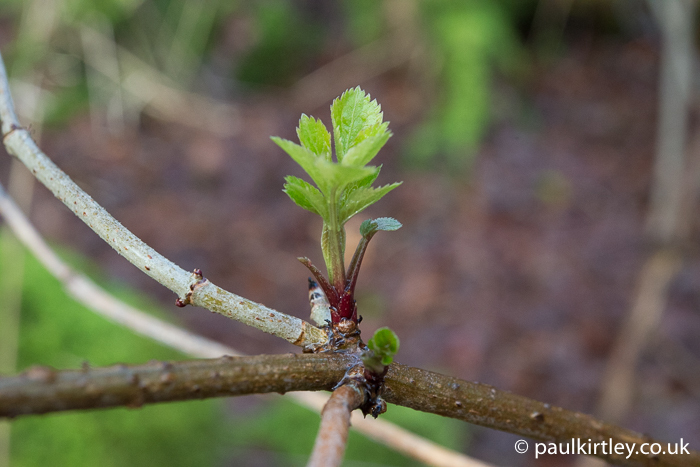 Elder leaves are well out before the blossom starts forming. Mid April. Photo: Paul Kirtley. The fruits of elder do contain some cyanogenic glycosides, though, (all green parts of elder do) so it is generally recommended that the fruits should be heated before consumption to avoid the chance of stomach upsets. A good field-expedient cordial can be easily made from the berries by reducing them down in a billy can. The wood of elder is good for friction fire, particularly hand-drills and the same shoots can be used to create straws for sip-wells or blow-tubes for encouraging your campfire. The bubbly, fizzy, business of elderflowers in full bloom. These will go on to form heavy clusters of dark elderberries. County Durham, late June. Photo: Paul Kirtley. Apples, forming the genus Malus are also members of the rose family, Rosaceae. There are many hybrids and cultivars and I don’t pretend to be in any way an expert on these. I can, however, recognise an apple tree in the wild, and for me this is what is important. 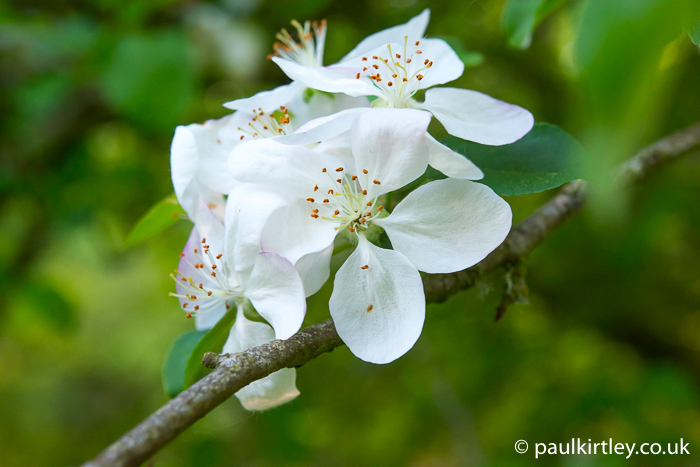 Apple blossom. East Sussex. early May. Photo: Paul Kirtley. It’s hard to find pure crab apples these days but there are plenty of feral apple trees out there once you start looking. I’m told that any apple blossom containing some pink has at least as small part cultivated apple, and is not a pure crab apple. Even so, there are specimens falling under this mixed heritage that have small and very acid, astringent fruits that make for unpleasant eating straight from the tree. They are definitely more crab than any sweet, juicy cultivar you’re used to sinking your teeth into. Even so, it’s worth knowing where the apples are in your neck of the woods. You can make great apple sauces and the like as well as using them for pectin in all manner of jams, jellies and conserves. I’ve used crab apples, or near as makes no odds, in combination with rowan berries to make some really good rowan jelly. All the ingredients are out there, largely being ignored by the wider population, but ready for you to harvest and make full use of. 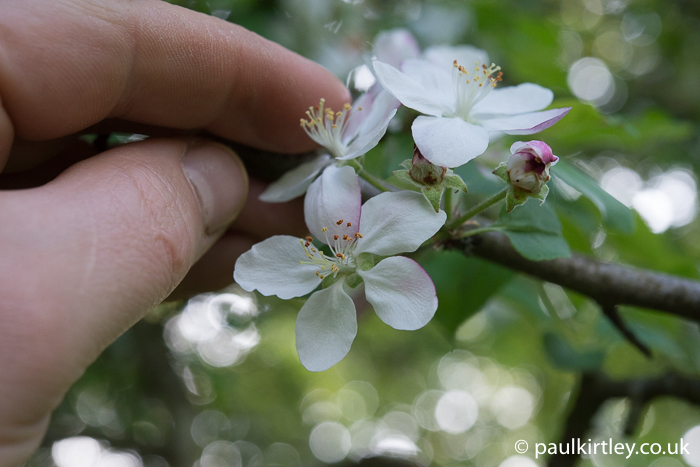 Wild apple blossom with the author’s hand for scale. Photo: Paul Kirtley. In the comments section below, let me know what was the stand-out piece of information you took away from reading this article. Also, which of these blossoms do you know and love? 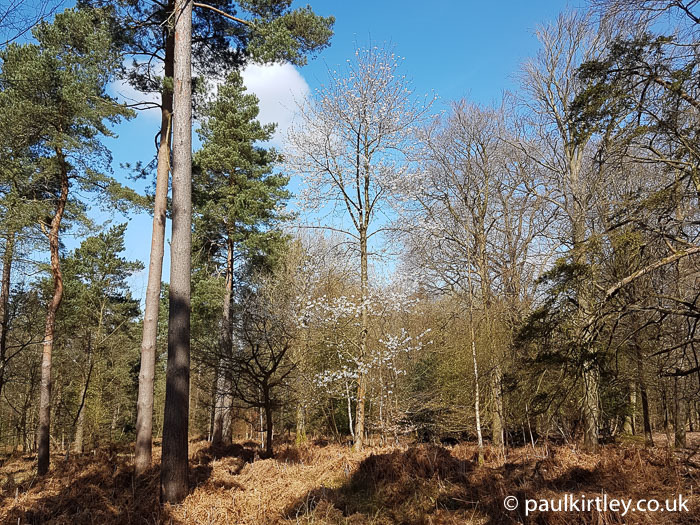 If you’d like to learn more about the identification of trees and plants that are useful for bushcraft and survival, you can request information on my Tree and Plant Identification Masterclass online course by clicking here. What a well-timed reminder that spring is hear. As I read, I became more and more impatient to get out and relish the blossom with a new eye. I shall look harder now I know more about the various plants that I had had previously lumped together as “may”. Thank you for yet another stimulating blog. Thank you for the detail . Very interesting . Thanks Paul, for a very informative blog. I have printed it off an d take it with me as an ecellent guide in my wanderings. cheers Paul. Although mostly familiar to me, this article was an excellent reminder and packed with detail, as well as new nuggets I wasn’t aware of. I’ll be sure to check out the many smells of the different species. An elder blow tube – I hadn’t thought of that – will definitely need to try that one out.